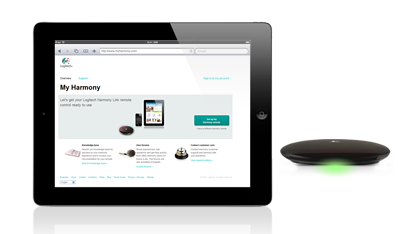 Logitech recently jumped into the phone and tablet universal remote market with the Harmony Link. The idea is simple: Make use of a phone or tablet to communicate via Wi-Fi to a bridge device which translates the commands to infrared (IR) for use by most home theater components. Logitech also adds in its Harmony database and setup routines used in other Harmony lines, for better or worse. Check out Engadget’s verdict on the product. A first encounter with a multitouch device gets any active imagination running, so of course a home theater fan thinks it could make for the ultimate remote. But can any of that promise be realized in the dead zone that is the consumer remote control space? The leader of that dead zone is ready to give it a try with the Harmony Link — a WiFi-to-IR bridge that allows you to control your TV from any room of the house via an iPhone, iPad, iPod Touch or Android device. For $100, it’s a setup that promises to blend ease of programming with network connectivity and multitouch control. So exactly how good is Logitech’s attempt? We’ll reveal that after the break, of course. Why does Logitech hate home automation?